Have you ever noticed how important it is for people to be right? Regardless of how someone else is choosing to see a particular person or life event, it’s easy to fall into a pattern of assuming that our lens is the right one. I refer to these situations as a bad case of rightitis (I made this up, so you won’t find it on WebMD). The question I often ask students is – What’s the cost of always being right? I can think of countless times when I’ve tried to assert my rightness on others, only to find that I had, in effect, alienated myself from them. Sorry, honey. I’m sure I’ve done this a time or two with you. I love you. Let’s do a little experiment to test your rightness. To begin, please read the sentence below. After you have read it a few times, count the number of F’s in the sentence. How many F’s are there? Look as many times as you want. Are you coming up with the same answer? THE EXPERIENCE OF MANY YEARS. Now that you’ve determined the number of F’s, I want you to choose another number (on a scale of 1-10) which represents the level of confidence you have in your answer. Let’s just call it the rightness scale. Okay, are you ready for the actual answer? There are six F’s in the sentence. 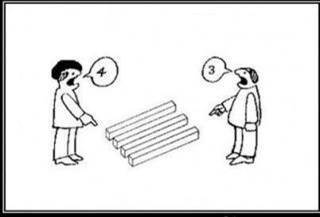 The majority of people will only see three of them. In fact, when I first completed this exercise, I only saw three. Less than 20% of people will see all six of the F’s. This is your rightness talking. Go ahead and look back at the sentence. I’m guessing you overlooked the word “of”. There are three of them. Regardless of how many F’s you saw, it’s safe to say that when we see something (our lens), we often assume that it must be the only way there is to see it. As you are well aware, there is always more than meets the eye. If we apply this principle to our relationships, for example, imagine the authentic communication that would take place. If we could simply acknowledge the fact that we MAY NOT be seeing the whole picture, the entire dynamic of the relationship would change. Rather than being stuck in our rightness, we would actually be exercising creativity and empathy. Below is an optical illusion that serves as a great illustration of how easy it is to fall into a pattern of being right. Here’s my suggestion. The next time you find yourself suffering from rightitis, take a step back and try to see the entire picture. After all, it’s better to be happy than to be right, right?.